The Maryland Department of Transportation State Highway Administration (MDOT SHA) collects, maintains, and uses data on Maryland’s highways to generate inputs for planning and system operations efforts. As Maryland continues to grow, providing a high quality, reliable transportation system will be vital, creating the need for responsible planning and performance driven decisions to ensure safety, mobility, and multi-modal choices for the movement of people and goods. To ensure data driven decisions, high intensity computer models are being developed for different stages of project planning to ensure that cutting edge technology and tools are being used to generate the most accurate results. MDOT SHA’s approach has been to develop a multi-tiered modeling methodology to aid in data driven transportation decisions, as discussed below. Travel Demand Models (TDMs) are particularly useful for measuring system performance and for performance-based planning. They are used in corridor studies, long range planning, freight movement, system performance and scenario analysis, to name a few examples. MDOT SHA developed a statewide model, called the Maryland Statewide Transportation Model (MSTM). The MSTM is a multi-layer travel demand model working at national, statewide and urban zone levels to forecast and analyze key measures of transportation system performance. 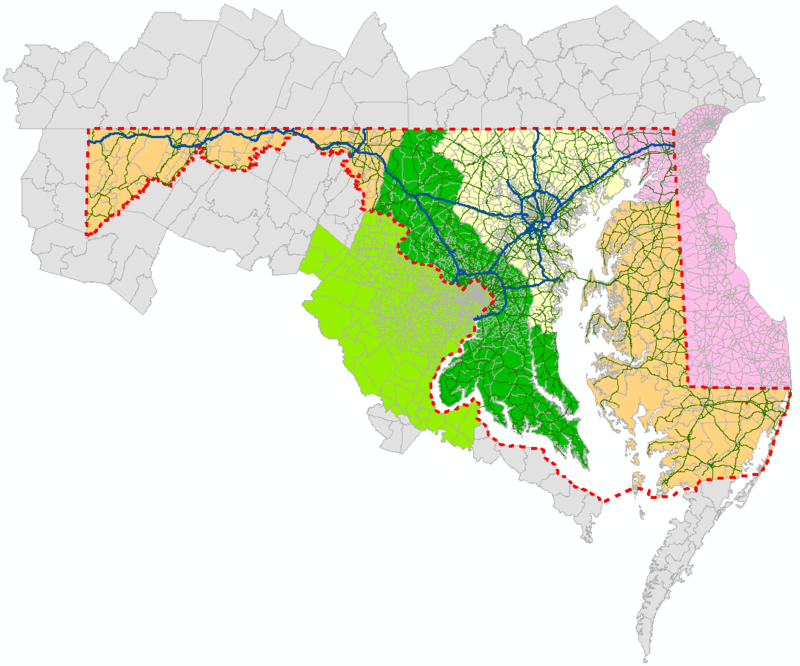 The MSTM can seamlessly integrate regional Metropolitan Planning Organizations (MPO) zone data, such as MWCOG and BMC, but also provides coverage for regions without a local MPO. This has significantly impacted how well MDOT SHA forecasts traffic volumes in these regions. Effects of through traffic and projects in neighboring states that influence travel patterns in Maryland are part of the capabilities of this model. The model is a living tool which will change as enhancements are developed. For example, MDOT SHA is currently working on developing an Activity Based Model of the MSTM. TDMs are always the first step in a planning effort because they generate future traffic volumes for project alternative analysis. A new method of traffic operations analysis has come to the forefront within the past two years: instead of generating zone data like the TDMs, mesoscopic models dynamically reroute trips due to congestion based on much more refined speed information. Mesoscopic still requires trip information from TDMs but can more accurately generate system operations (speed and volume for example) and related planning efforts. MDOT SHA is still currently evaluating best practices and will incorporate mesoscopic modeling in the planning process once a systematic and data driven methodology has been established. Highly detailed and intensive, microsimulation models generate every single vehicle on the facility of interest, usually for a single intersection or for a very specific corridor. The models analyze and predict traffic patterns and can push out a significant amount of information, including vehicle delays, transit travel speeds, pedestrian delays at intersections, Highway Capacity Manual based level of service (LOS), among many other metrics. MDOT SHA currently uses VISSIM and Synchro on a frequent basis, but welcomes analysis from all software as long as calibration documentation is provided. MDOT SHA VISSIM Modeling Guidance: This document provides best practice guidance for VISSIM. The use of VISSIM as a microsimulation tool is not a requirement; MDOT SHA welcomes to use of other microsimulation modeling software, so long as the methodologies are well documented and that the general criteria (applicable to all microsimulation models, such as calibration) described in the VISSIM Modeling Guidance are used. This document also outlines recommended ranges for behavior model parameters. Model Request Form: please complete this Model Request Form if you wish to receive a copy of specific model files (VISSIM, Synchro, MSTM, etc). Note that we do not distribute model files for ongoing projects; exceptions on a case by case basis. MDOT SHA Controlled Access and Driving Behaviors VISSIM Network: MDOT SHA developed a ‘base’ geometry VISSIM network of controlled access facilities in Maryland for anyone to use. This network does not include routing, vehicle inputs, conflict area etc. The network is meant solely as a starting point for those wishing to save time and cost in the development of VISSIM networks for controlled access facilities in Maryland. Minor sections of controlled access facilities not connected to the main ‘trunk’ of the system were not included (portions of MD 5, for example) and the southern portion of the US 29 corridor (uncontrolled access) was also included due to transit routing needs. This network also includes best practice Driving Behaviors frequently used by MDOT SHA staff for corridor and network calibration (see VISSIM Modeling Guidance document above). These behaviors are only meant to aid in the calibration process but may be altered to better reflect the corridor being modeled.